It's been a looooong time since I wrote a Makers' Monday post. In case you've forgotten, Makers' Monday is a celebration of knitting designers, artists and creatives of all types. Today, I thought I'd celebrate two very different creatives, both with Etsy shops, who I've purchased from recently. The first is Flame Noir Candle Co.. 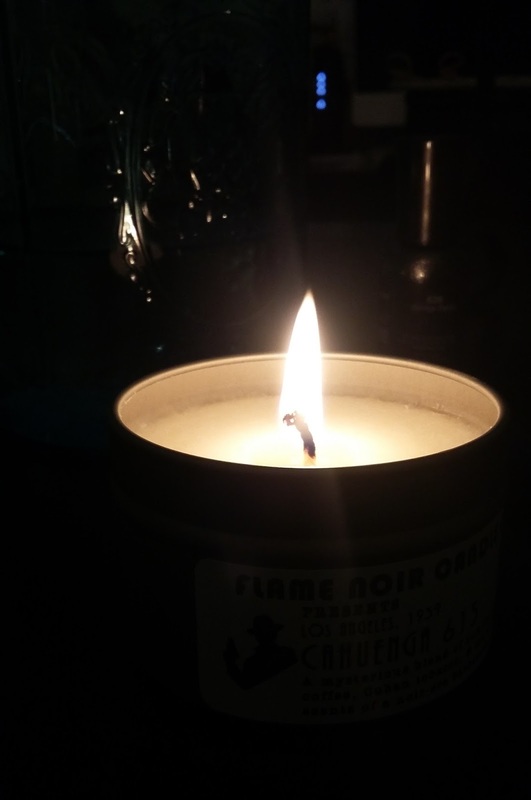 I ordered a Cahuenga 615 candle and LOVE it! I'm always a little leery of buying anything 'smelly' off the internet. Besides being crazy picky about what I like, certain perfumes/scents/chemicals give me horrible migraines. But this candle, Oh! My! Gosh! It smells SO good and I'm totally migraine free. I love the way Flame Noir describes their candles story-style. Although my candle is supposed to smell like Philip Marlowe, when ever I light it, I'm instantly reminded of being about four years old and curling up in my dad's lap for a story or just hanging out with him. Apparently Philip Marlowe and my dad both smelled of coffee and tobacco with a slight hint of gun oil and Old Spice cologne. Gosh, this candle makes me miss my dad, but in a nice, sentimental way. Next on my list is ilovedesign who has the cutest washi tapes. After buying my Volkswagen back in September, I went a little bit crazy buying Volkswagen stuff. A quick search on Etsy brought me to iluvdesign's VW washi tape. Isn't it adorable? I haven't always had a lot of luck with washi/decorative tapes. First, I'm so uncoordinated that I don't ususally get along with anything sticky. Tape tends to end up everywhere but where I want it. But this tape is fantastic! It's super sticky yet is easily removable and easily re positioned. You can re position it multiple times and it stays wherever you move it. Believe me! I've moved a single piece many, many times trying to get it just so. I just love this washi tape! Both of these artistic businesses offer great giftables so make sure you check them out when you start your holiday shopping. Oh wow, thanks for these suggestions! I'm off to see what is what.